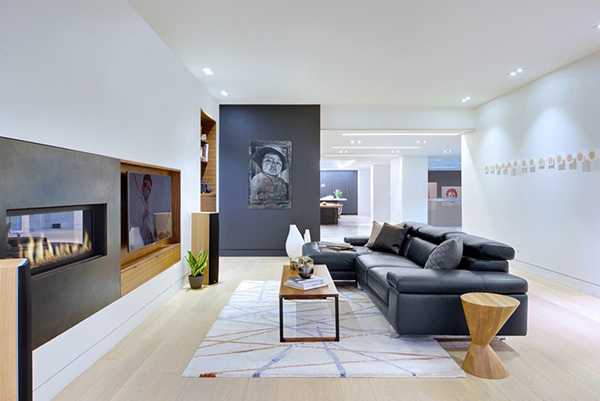 Just recently, we have featured a home that is owned by an art collector. Hence, his home was filled by different are collections. Such a lovely fusion of art exhibits and the functions of the home. But that isn’t the only home that reflects the hobby and interest of the owners. In truth, there are many dwellings like this because every home would be a reflection of what one loves. 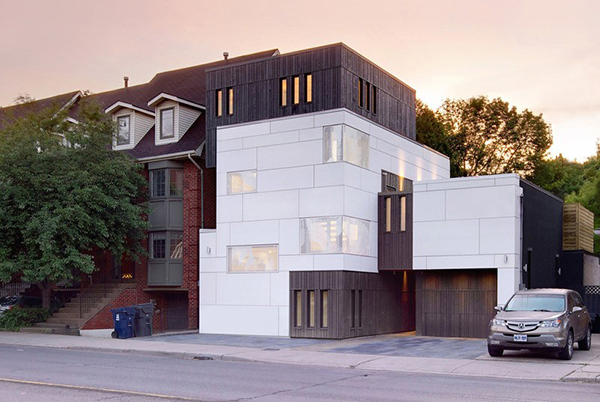 The Mount Pleasant House is built on a site that was once a home Cruickshank’s more than half a century ago which is a flower bulb distributor. But it was closed and vacated in 2001. The house was then occupied by different owners until a local music enthusiast purchased it and revived it into an exciting home. 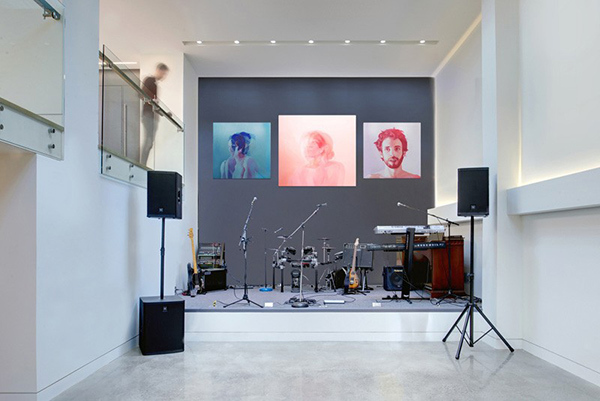 The house was converted into “two connected yet disparate buildings into a single cohesive new home with a focus on music and entertainment”. 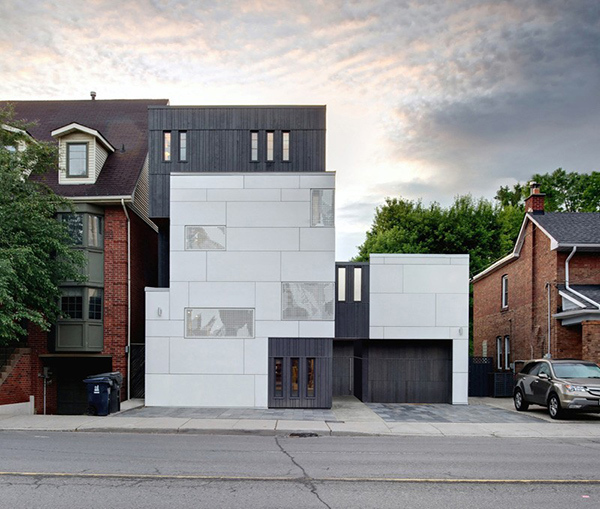 Let us take a look at this home in Toronto, Canada. Isn’t the exterior an intriguing and interesting sight? It looks very beautiful in white and gray! The house seem to provide shelter from the street, with only a few, carefully placed windows. The interior has some posters that shows some music icons. This modern living room has some colorful design on the area rug. 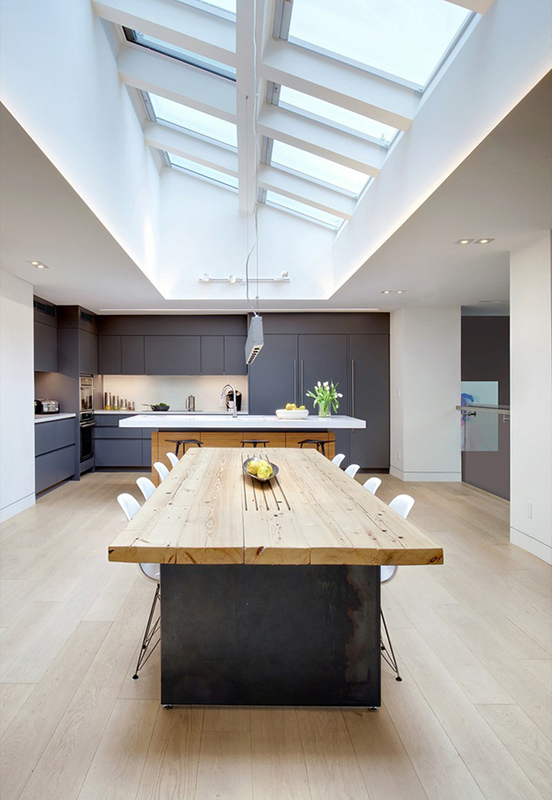 Skylights are used in this dining and kitchen area to let natural light flood in. 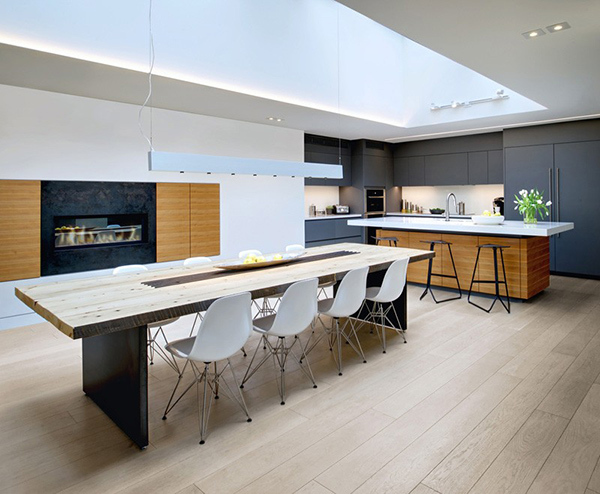 And it does look amazing with all those light from above especially with the combination of white and wood in here. 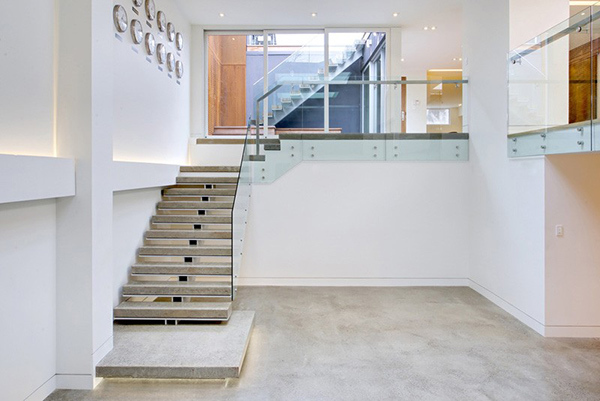 From the ground floor, it leads to the upper area with this beautiful staircase in glass railings. 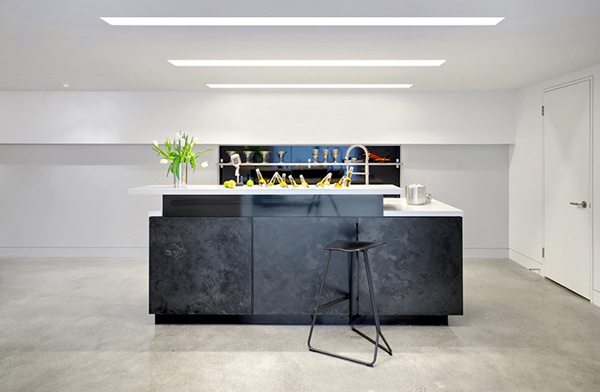 A bar with dark gray color sits with pride in this part of the home. And of course, there is a music area where they can play with music instruments. Another look at the stunning staircase. Note the light under the first step to make it appear like floating. 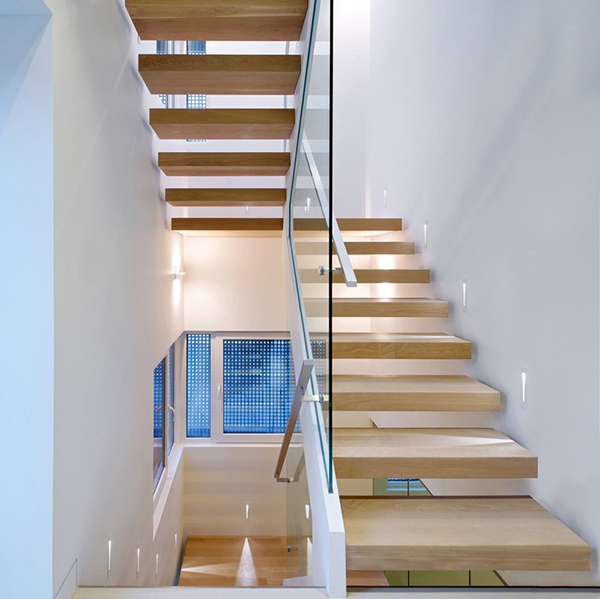 To get into the higher areas of the house, this wooden staircase with glass are used. A sliding door is used in the bedroom to access the outdoor area easily. I love the design of this bedroom with wooden headboard! 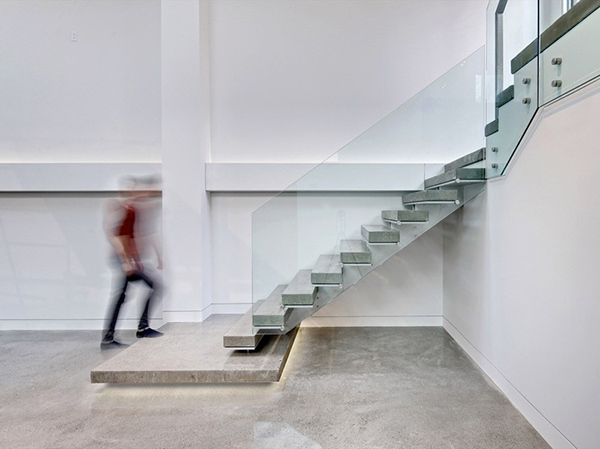 A tall steel screen is used for this staircase area to give it some privacy. The house was once a fixture in the neighborhood. 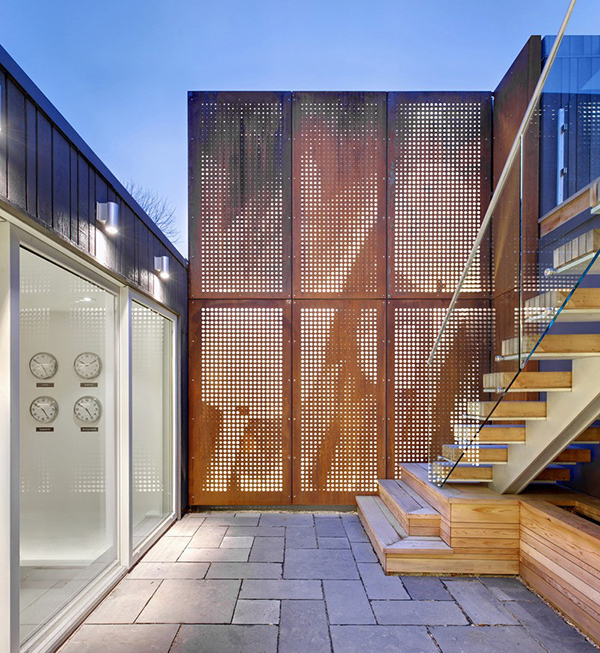 But as it was restored to prominence in the neighborhood, the “revitalizing overhaul ensured that the building will remain a proud part of the Toronto streetscape for many years to come”. Well, just look at the amazing architecture of the house. It sure is something that one would definitely look up to! Great design from Roundabout Studio who was able to make the building a prominent part of the area once again.